As with any surgical procedure, it’s common to have questions and concerns about recovery time, what to expect, or even the surgery itself. At Carlsbad Eye Care, ophthalmologist Dr. Tracy takes great care to ensure that all of his patients feel comfortable and informed while in his care. If you’re thinking about receiving PRK eye surgery, please read below to see some of the most commonly asked questions regarding this laser eye surgery! If you have a question that isn’t listed below, please feel free to contact Carlsbad Eye Care by calling (760) 603-9910 today! Also, please visit the PRK page on WebMD to learn more about this exciting procedure! Question: How long should I expect my visit to be with Dr. Tracy for my PRK eye surgery? Answer: Although the procedure itself takes only about ten minutes per eye, you should plan on being at the surgery center for about two hours, to allow for prep time and post-op care. Question: What does Dr. Tracy advise that I do to prepare for my PRK surgery? Answer: If you wear contact lenses, you need to leave them out for 2 weeks (for soft lenses) or 6 weeks (for hard lenses) before your surgery. Before your procedure, be sure to arrange a ride to and from the doctor’s office, since you will not be able to drive on the day of your surgery. Make sure that you can take 2-4 days off from work. Pick up medications that Dr. Tracy has prescribed. You will begin using them immediately. You may want to eat a light meal (no caffeine) a couple of hours before. Wear comfortable clothes, and bring a sweater or sweatshirt, as it can get cold in the laser suite. Do not wear any makeup, perfume, or jewelry. Question: What can I expect after my PRK surgery? What is recovery like? Answer: After the procedure, a bandage contact lens will be placed on your eyes, to protect them while the epithelium is healing. So you may feel like there is something in your eye for about a week after. Dr. Tracy will remove the bandage contact lenses at your 1-week post-op visit, once he is sure your epithelium has healed. You will need to use the eye drops that have been prescribed – antibiotic eye drops, steroid eye drops, and drops to prevent pain. Question: Will my ophthalmologist be present during my PRK procedure? 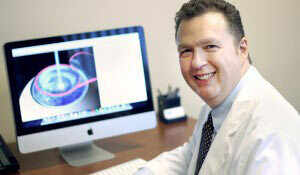 Answer: Yes, Dr. Tracy will be your ophthalmologist and surgeon, and he will be with you every step of the way. He will be there for your consultation appointment to perform your tests, he will perform the surgery itself, and he will examine your eyes at your post-operative appointments. Answer: You won’t feel pain during the procedure iself, because Dr. Tracy will place anesthetic eye drops in your eyes first. After your surgery, you will use eye drops to prevent pain, and you may also use pain medication that will be prescribed to you if necessary. Most patients report only mild discomfort a day or so later. Question: I’ve heard PRK surgery is much more painful and has a longer recovery time than LASIK. What is the reality on this procedure? Answer: PRK does have a longer recovery time than LASIK. With advanced surface ablation (PRK), the epithelium (the thin outermost layer covering the cornea) is brushed away, and this must heal before the vision really begins to get better. This healing takes about 3-5 days. Most people see in the 20/40 range the next day after and can drive. After the first week or so, recovery is similar to LASIK. The discomfort after PRK is usually not severe, but it is worse than LASIK. Most patients report that the eyes feel scratchy for the first week. So for PRK patients, I prescribe eye drops to prevent pain. As a result, the discomfort is generally very well tolerated, and some patients notice no discomfort at all. Question: PRK vs LASIK? I’m a Minus 8 with Dry Eye. Answer: Just like in any other specialty, each surgeon is going to have a different opinion. Historically, PRK has been safer than LASIK because no flap is created. Keep in mind the long-term results of the procedures are the same. The difference is in the first month or so during the healing process. I would recommend you ask the surgeon to explain WHY he is recommending each procedure and then see whom you feel most comfortable with and what procedure. Question: I am 21, have a prescription of -10 (Right) and -8 (Left) and corneal thickness of 485 for one eye and 500 for other. I went to one clinic and they said I am not eligible for LASIK. Now my question is am I eligible for PRK , as I read that it is ideal for people with thin corneas, or is ICL the only procedure that can be done for me? Answer: ICL is the best option for you. It is best to always leave at least 400 microns of cornea behind when doing PRK. This is simply not possible in your case. Question: I have starbursts and glare when my eyes are dilated after I got PRK. It is nearing 6 months and it hasn’t gotten any better since I first got the surgery. My doctor has given my Alphagan (which cures all my night issues) but I don’t want to be dependent on it for the rest of my life since it gives me dry and tired feeling eyes. I am seeing 20/20 so acuity is not an issue. What are my options? Will it resolve with time or have I ruined my night vision? Answer: The first thing to try is definitely waiting longer, perhaps six more months. Most glare and halos vanish after 6 months but they can last longer. For now they are manageable with brimonidine and your vision is good. Most glare and halos are caused by having a small amount of residual astigmatism that is not enough to affect vision during daylight. If this persists once your refraction stabilizes, you have the option of pursuing an enhancement procedure to fix this, or glasses for nighttime driving. I would be reluctant to perform an enhancement on a 20/20 patient unless the glare and halos were debilitating. Question: I’m 21 years old with a prescription of 5.0 left+4.5 right (1.25 cylindrical). My corneal thickness is 470 & 480 microns. My topography was good and I don’t have any corneal abnormalities. My doctor recommended ICL treatment, even though I’m eligible for PRK. What is my best option for corrective eye surgery? Answer: Given your youth and thin corneas, I would personally not recommend laser surgery (PRK, LASEK, LASIK or Epi-LASIK). You have too many risk factors for kerato-ectasia even if your scans are normal. I do not personally perform ICL’s, but they are an effective, FDA approved option if you are determined to have surgery. Question: Before my PRK procedure by right eye was 6/60 (without glasses) and my left eye was 6/36 (without Glasses). 20 days after my procedure my right eye was 6/18 (without Glasses) and my left eye was 6/12 (without Glasses). My doctor tells me my vision should become 6/9 after 1 month. Is this true? Answer: Everyone heals differently. Unfortunately, no one can predict in advance when your vision will be 6/6 or 6/9 after PRK. At a month after surgery, you should be seeing continuing improvement of your vision, but there is a lot of variation in the specifics. If your vision is not improving, is getting worse, or you develop new symptoms, you should see your surgeon right away. Question: After PRK, I got my bandage contact lenses taken out and had the worse pain in my left eye. I went back to the doctor and he scratched my epithelium and put the contact lens on it again. My eye is still painful, with a burning sensation, and not so good vision. What happened and what should I do? Answer: Sometimes when the contact lens falls out prematurely, it takes a bit of the surface tissue (epithelium) with it resulting in pain, redness, blurred vision. This will generally improve over the next few days and in a week or so will most likely be similar to the other eye. Question: I have been diagnosed as good for PRK, as I have thin corneas and dry eye. I know there are risks with the dry eye. What’s your option on going ahead? I have two prescriptions. Answer: PRK uses less cornea than LASIK and causes less dry eye. The outcomes are the same or better. If you are a candidate for PRK and can tolerate the initial discomfort and blurred vision, it is at least as good as having LASIK. Question: I had my PRK surgery done last month, my right eye seems to do well and then fluctuate throughout the day, however my left eye feels the same as the day of surgery. What went wrong? Does my that mean my left eye will need an enhancement? Is this normal and will it get better? Answer: A lot of things may be going on here, depending on your prescription and other factors. One month after surgery is usually too early to judge whether you will need an enhancement. You may just need more time to heal. The most important thing is for your surgeon to make certain that you have no other eye problems (retinal detachment, etc.). Question: I had PRK 1 week ago and my right eye has been in pain and right now I’m 20/40. Is that normal? Answer: 20/40 is pretty normal a week after surgery depending on your prescription. Having more pain in one eye than in the other is also very common. If your surgeon has examined you and you are doing well, most likely your vision will continue to improve in both eyes. Question: I am 28, have a prescription of -3.0 (right) and -2.0 (left) and a central corneal thickness of 470 in both eyes. Do you recommend ICL or PRK for thin corneas? Answer: With corneas as thin as yours, I would be reluctant to recommend LASIK or PRK. Using the standard Randleman criteria, you would be classified as “high risk” for LASIK and “unknown risk” for PRK. If you are determined to have a procedure, an ICL may be your best option. But waiting until you are 30 to have anything done would reduce your risk into the “moderate” category for LASIK and also give us time to find safer alternatives. Until then, I prefer glasses to contact lenses. Given your low prescription, you do not even need to wear your glasses all the time if you can function without them. Question: PRK instead of LASIK for thick cornea? What is the healing time? My thickness for both corneas is 470 and 472. Is it safe to go ahead with the procedure and can I go back to school on a Monday or Tuesday if I have the surgery on a Friday? Answer: I would not recommend PRK or LASIK in a patient with such thin corneas, ESPECIALLY if you are young enough to still be in school. I would wait until you are 30 years old to consider any laser procedure given your thin corneas. Question: Since PRK, I have blurry vision throughout the day and colors appear duller. I also have ghosting day and night, halos and star bursts. Previously I has myopia -5.50 and astigmatism -3.50 in both eyes. Will this improve? Answer: You had a large treatment with significant astigmatism in both eyes so your vision should continue to improve for several more months. Having said that, after three months your vision would generally be moving in the right direction. If you have seen no improvement at all, it is possible you will need an enhancement at some point. It would be best to have your surgeon take a look to make sure that you do not have any problems unrelated to your surgery that might be affecting your vision. Question: I have halos and starbursts one year after PRK. No scarring or haze, and 20/20 vision besides that. What are my options? Answer: The most common reason for glare and halos at night is that you have a small amount of residual astigmatism in your eyes. This could theoretically be treated by doing more laser, but if you are 20/20 and able to drive at night the best course may be to leave it alone. Dry eyes can contribute to GASH (Glare, Arcs, Streaks, Halos) and if you are not taking artificial tears this may help. There are also drops such as Alphagan P that get rid of glare and halos, but you would have to take these drops nightly. Question: Is it good news to hear that, after 4 days post PRK surgery, that you are healing extremely fast? Answer: It is very good news. A few days after PRK, the vision gets somewhat worse as the epithelium on the eye heals, before beginning to improve again. This is typically the same day the pain goes away. This may happen a bit sooner for you. Other than being aware of that, healing fast is great. Question: I’ve had my right eye scraped twice since PRK due to hazing because of dry eye. Is this normal? Will my outcome be affected? Answer: Scraping for haze so soon after PRK is unusual. Haze normally forms a month after surgery and is often treated with steroid drops and if that fails with superficial keratectomy and Mitomycin C. Haze will eventually go away even if it is not treated, but can take a year to resolve. Dry eyes can definitely slow down the healing process. If you cannot tolerate the contact lenses it may be best to let you heal without them and use a thick gel or ointment to lubricate your eyes while healing. Question: I have examined my eyes thoroughly from specialist doctors. My eye side weak is left (-2) and right (-2). After my examination the only problem for me is central thickness of corneal which is 460 microns in my case. Doctor would not recommended LASIK for this thickness. Please tell me whether PRK will be better for me as I don’t want to wear glasses. My age is 26 and there are no other diseases or complexities in my report except corneal thickness. Please guide whether I will go for PRK or not? Answer: From the risk factors you have mentioned, you get four points on the Randleman Scale. This makes you a high-risk patient. Most surgeons would not perform LASIK in your case and the safety of PRK has not been positively established for patients with your risk profile (although it is generally believed to be safer). I would not do any laser procedure on someone in your situation. I don’t think there is any reason to take risks with elective surgery. Question: What should I expect from an enhancement PRK surgery? Is it normal to have complete blurry vision two weeks after surgery? It’s been about 10 days since my enhancement and I literally can’t read a book in my lap without a struggle. I know I’m in the healing process, but I’m just a bit concerned because I can’t really see anything. My vision is way worse than before my enhancement. Is this normal? Am I being impatient? Any suggestions? Answer: A lot depends on the nature of the enhancement you had. Modern enhancements are generally done by surface ablation rather then relifting the flap. This is MUCH safer but leaves the vision blurred for longer afterwards. Also, far-sighted (positive spherical) enhancements leave the vision blurry for longer. The most important thing is to have your surgeon check you out if you have not already done so. You’ll want to make sure there is nothing else going on before you assume this is just normal healing, although feeling impatient is certainly part of normal healing also. Question: Should I be concerned about an uncomfortable sensation and less clarity in vision two weeks after PRK surgery? Answer: You may have injured the surface of your cornea (the epithelium). If so, your surgeon will want to put you on antibiotic drops while it’s healing to keep it from becoming infested. Please see your eye doctor right away. Question: I had LASIK in 2001 and had PRK on 12/20/13. During my first check up on 12/24/13, my vision was doing really well. I was cleared to drive and the contacts were taken out. Three days later I could see NOTHING. I went back to my doctor and I’m now farsighted (I was nearsighted). I was told not to worry and that it would get better. It is now 12/30/13 and it keeps getting worse. Should I be worried? I can’t get in to see my surgeon until later. Answer: The symptoms you have described sound normal for healing after PRK. The vision does get worse after a few days as the epithelium (skin) on the cornea heals, and then begins improving again very soon thereafter. If you are saying your vision “keeps getting worse” day after day, I would see your surgeon or another doctor right away to be sure you do not have another eye problem. Question: Are individuals 50 and older at a higher risk for PRK under/over-correction due to the tissue being weaker? I have heard that because the tissue is weaker, the laser could remove more than the treatment zone and leave you with an over-correction or under-correction. Answer: The quality of the tissue is probably a factor but even more so dry eyes. Older patients are more likely to have dry eyes and dry eyes increase the chance of regression. As a result, surgeons generally treat dry eyes aggressively in older patients before considering refractive surgery. This is true for PRK and LASIK. Question: I am looking to have PRK in my left eye. I have a corneal scar in this eye. Is it likely to regenerate after PRK surgery? Answer: A lot depends on the size and location of the scar. Small scars associated with contact lens wear generally do not return after PRK. Larger scars may need to be treated with PTK before PRK. In any case it is best to use Mitomycin C after PRK to prevent scars from returning. Question: I had surgery thirteen months ago. My vision is fine but I still use eye drops (Hyabuak) because I feel my eyes dry. Not so much as the beginning, but 3-4 drops every day. What is more, I drop water to my face 3-4 times every day because I feel that this helps. When will I stop the eye drops? Is it logical after one year to use still eye drops? Answer: Dry eyes after PRK does occur and can in some cases last a year or more. Equally common is for patients to be more aware of dry eye symptoms or ocular allergies because they no longer have contact lenses covering their corneas. Using artificial tears like Hyabuak is always healthy even for a patient who has not had surgery. It is like putting moisturizer on the skin! Question: I am 33 with a 15 year history of wearing contacts with -9.00 both eyes. Corneal thickness is 630mm. I have been also seeing floaters for the past couple of years, but all ophthalmologists I have went to said my eyes are healthy. I went to couple of consultations recommending I do LASIK. However, I am reading more about how PRK is less invasive and may have lesser side effects (such as dry eyes). I am not worried about healing time so which one would you recommend? Answer: PRK is safer than LASIK in both the short and the long term, but has a longer recovery. Complications are more common in younger patients like yourself and in higher prescriptions like yourself. If recovery time is not an issue and you want the safest procedure possible, then PRK may be the better option for you. Question: I had PRK (thin corneas) seven years ago. Since then, I have had two pregnancies. I am currently two months postpartum. I have noticed no changes during pregnancy to my vision. However, in the past week I have noticed an “uneven balance” in my eye sight. My left eye seems to be a tad blurry. I am not nursing and still have not had a postpartum cycle. Should I be concerned about the vision in my left eye or will it balance out? Answer: There are a lot of changes that can occur to the eye during pregnancy. Some of them are serious, so please have your ophthalmologist see you as soon as possible. It is true that a glasses prescription can change during pregnancy and will generally go back to normal, but it is not safe to assume that is your problem until you have had a thorough eye exam. Question: My prescription is -9.00 in each eye, and corneas are 487 and 488 in thickness. I am 25-years-old and have no eye diseases and no dry eyes. Am I a good candidate for PRK? Two surgeons at separate clinics both said yes, but I’d like some other professional opinions, please. Am I at significantly greater risk for complications? Answer: I would not operate on you. By the Randleman criteria, you are not a candidate for LASIK and the safety of PRK in your risk group has not yet been determined (although it is generally believed to be safer). If you wait until the age of thirty, your risk of complications goes down, but honestly I would wait for more research to be published that establishes the safety of PRK in your risk group. You may wish to consider implantable contact lenses if you cannot tolerate glasses. Question: Hi, Just looking for some thoughts on this. My eyes are -2.75, and -3, corneal thickness of 445. Am I an eligible candidate for PRK ? I don’t have any eye problem and I don’t have dry eyes. Answer: I would not do any laser surgery on a cornea that thin due to the risk of complications. If you are determined to have surgery you may want to consider implantable contact lenses but please remember glasses are always a safe and reliable option. Question: I had LASIK surgery in 2003 in both eyes which corrected me to 20/20. After 10 years, my near sightedness gradually regressed to roughly 20/40 or 20/60. I decided to consider an enhancement, and went back to my original surgeon, who recommended PRK this time, one eye at a time. I underwent the surgery in my left eye in November 2013. Nearly four months later, best case, the improvement in my left eye has been negligible. Should I be concerned? What questions should I ask at my next appointment? Answer: PRK is generally considered the best way to perform enhancements after LASIK, since re-lifting the flap can lead to so many complications. Four months is a relatively long period to see no improvement. Your surgeon will want to asses if you have some eye condition that is affecting your vision, if you have developed haze, or if you have achieved the desired refraction (plano if this is a distance treatment). Vision does improve for several months after PRK and longer if you were hyperopic, so this may just be normal healing. Question: Am I a candidate for PRk surgery? My age is 25 and my cornea thickness is 450 and 452. I hate wearing glasses. Can I go for PRK? My doctor suggested that I wear glasses for next six months. Answer: Corneas of 450 microns are not considered safe for LASIK and the risk is unknown for PRK. My recommendation is always to hold off until there is research convincingly demonstrating safety before you consider any surgery. Question: What to do after unsatisfactory PRK results? I got my PRK two and half months back. At the start it was awesome, but after one month I felt that my right eye vision was slightly dim. Then after 45 days my doctor stopped me from taking artificial tears and put me on some low potency steroids. After that day my vision started to decline progressively. I cant see the faces properly and in dark or dim light the condition is worse. I rechecked my vision and its 4/6 in each. Answer: There are a number of reasons your vision may get worse a month after surgery. As long as your doctor has made sure that you do not have a serious eye disease, the most likely are haze or regression. Haze usually forms a month after surgery and is often treated with topical steroids. Haze eventually resolves on its own but can take up to a year to do so and as a result surgeons with often remove the haze with an Amoyls brush and then soak the cornea in a drug called Mitomycin to break up haze if it does not resolve with topical steroids. Regression involves the eye regaining some of its original error after the surgery. If this happens your surgeon will wait until your vision is stable and then retreat with more laser. Question: Dry eyes after sixteen months of PRK surgery. Will it continue? If so, how I can heal this symptom? Answer: Dry eyes almost always resolve six months to a year after PRK. If your dry eyes persist you may have other risk factors such as allergies, ocular rosacea, or floppy eyelid syndrome. Your surgeon can recommend appropriate treatments for these depending on the severity, from punctual plugs to Restasis to Intense Pulsed Light Therapy. Question: Will I have to use eyedrops forever due to dry eyes after PRK surgery? I had a PRK surgery 15 months ago. I still use eye drops (Hyabuak) because I feel my eyes dry. I would like to know if I will use eye drops for all of my life. What is more, if it is logical to see better from one eye. Furthermore, sometimes I feel a little pain in my eyes. This one is appeared last 2 months. Maybe because I join in army and here the environment is not so clear. Answer: Dry eyes almost always resolve six months to a year after PRK. If your dry eyes persist you may have other risk factors such as allergies, ocular rosacea or floppy eyelid syndrome. This could also be the cause of your eye pain. The two eyes are usually very similar in vision after 15 months. Since your symptoms are new, the best first step is to see your surgeon. If you have dry eyes, he can recommend appropriate treatments depending on the severity from punctual plugs to Restasis to Intense Pulsed Light Therapy. He can also treat allergic conjunctivitis from seasonal allergies which sounds possible since your symptoms have occurred so long after surgery. Question: Is the healing time of PRK faster if you have a lower prescription? I have a low prescription to help with seeing anything far away from me. I wondering if the healing time of PRK is better for people who do not have terrible eye sight? Answer: It is a little faster, but with modern techniques the healing time after PRK is much less burdensome than it once was. With the most advanced methods, a patient a week out from PRK is very comparable to a day out from LASIK and with much less chance of complications. Question: Sixteen months after my PRK surgery, I developed blepharitis which is giving me pain and dryness. Is this linked to my PRK surgery? Answer: Blepharitis is not linked to laser surgery. Most often it is generic and caused by a condition of the skin called rosacea. Question: Vision getting worse 13 days after PRK surgery? I had PRK surgery twelve days ago and my vision has been great but I’m noticing today that I have pain in one eye that I didn’t have before and my vision seems to have gotten worse. Is this normal? Answer: That is not normal. This is a new symptom. See your doctor right away. Most likely you have gotten something in your or scratched your cornea but the only way to be sure is to be seen at once to be certain it is not something serious. Question: Which is safer: PRK or INTRALASE LASIK? I am a candidate for both. Answer: PRK is safer than any other refractive procedure. The advantage to iLASIK is more rapid recovery but at higher risk. Question: I have had 4 cornea abrasions since my PRK surgery a year and a half ago. Since then, I have had a total of four cornea abrasions between both eyes. Every night before bed, I put Muro 128 ointment on my water-line so my eyes stay lubricated (the abrasion usually occurs when I open my eyes in the morning). I also have trained myself not to open my eyes when I first wake up without putting in wetting drops in each eye. I feel like I am doing everything possible yet this is still continuing to happen to me. My eye doctor has really been great helping me understand what is happening and what steps are appropriate for me. The last time I had an abrasion on my right eye (two months ago) I wore a bandage contact for four weeks. For me, wearing a contact over night would eliminate this problem I am having since each abrasion I have had has happened over night. Answer: Using Muro 128 ointment at bedtime plus Muro drops 4 x/day for six months is effective about 90% of the time in eliminating recurrent corneal erosions. Another option is PTK (a laser treatment) followed by Muro for six months. The two together are effective about 98% of the time. Question: What is your advice on swimming after PRK? What is your advice on swimming, paddling or having sea/river water splashing on the eyes after PRK? I had my surgery ten days ago. Can I go swimming yet? I’ll protect my eyes with goggles. Answer: You should not go swimming until your epithelium (the surface of the eye) is healed. Two weeks is usually sufficient but the only way to be certain if it is safe to swim is to have your surgeon check your eyes. Question: Why is there a difference in residual stromal bed for PRK and LASIK? I have recently been considering eye surgery to correct my myopia. My glasses prescription is -6.5 with -0.5 astigmatism in both eyes. My corneal thickness is about 494 in one eye and 516 in the other. I’m pretty sure LASIK is out of the question but just wondering about PRK? I’ve read that the ideal residual stromal bed for LASIK is 250 whereas for PRK it’s 400. This seems like a huge difference and I was just wondering why this is? Answer: You certainly may be a candidate for PRK, depending on your age and other factors. There are large studies demonstrating greater safety for LASIK with a residual bed of 300 or more. There are not yet comparable studies for the optimal bed depth after PRK so many surgeons (including myself) err on the side of caution and like to leave a bed of 400 or more. Question: If I received an eye exam from an optometrist, would he/she be able to tell I had PRK if I didn’t tell them? I’m curious if a doctor can tell by looking in the eyes if a patient had PRK. If they can, does it require the eye to be dilated or can the doctor tell during a regular eye exam? Answer: No one can tell you had PRK just by examining your eyes. In some cases it may be possible to tell using a corneal topographer (a scan of your cornea), but in most cases there is no way for anyone to know you have had surgery unless you tell them. 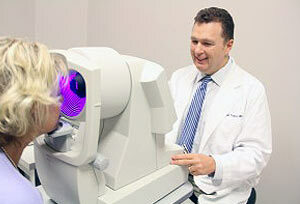 Question: What is the best laser technology for PRK? I’ve read that different types of lasers are better for different procedures. Of the lasers out there, which tend to be best suited for PRK? Answer: The VISX system is the one that has been used in the most clinical studies and therefore is the most predictable. It also uses a unique wavescan for each individual unlike the Allegretto. In most studies, the outcomes with the VISX have been slightly better than with other lasers.